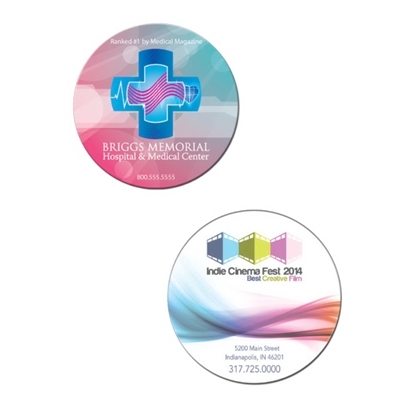 Bring your promotional campaign "full circle" when you hand out the 3" circle magnet! 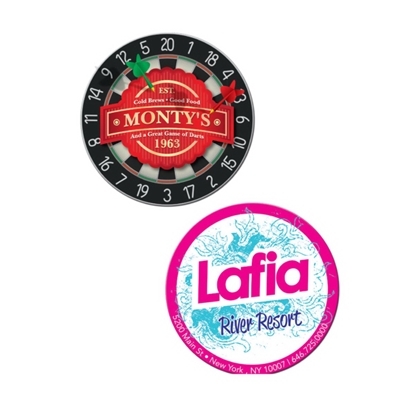 Made in the USA, this round magnet displays a beautiful 4-color imprint of your custom design that you can hang anywhere. Always in stock, this product measures 3" diameter and 20 mil. Free setup and full bleeds are available. 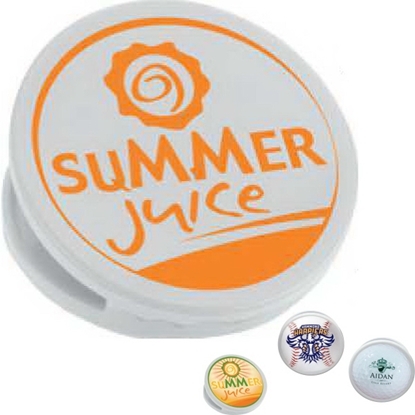 This item fits the promotional needs of special events, bars, restaurants, hotels, resorts and many more! 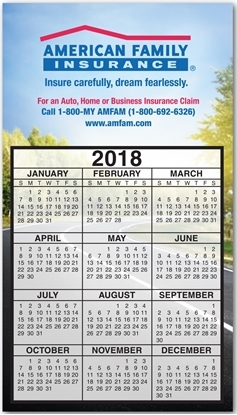 Earn maximum brand recognition fair and "square" with this always-visible promo! 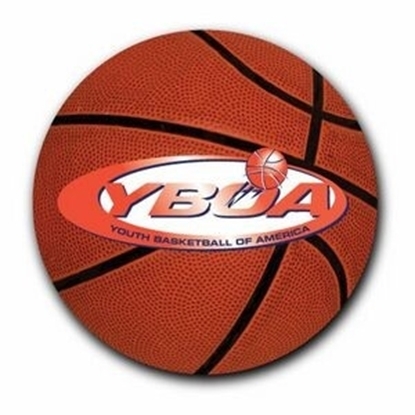 Made in the USA, our 3" x 3" square magnet displays a beautiful digital 4-color imprint of your logo. Take it to your next trade show and it'll hang on lots of refrigerators! Always in stock, the magnet measures 3" W x 3" H x 20 mil. Free setup and full bleeds are available. Ideal for special events, bars, restaurants, hotels, resorts and many more! Square off with the best of your competition with a promo that's always seen! 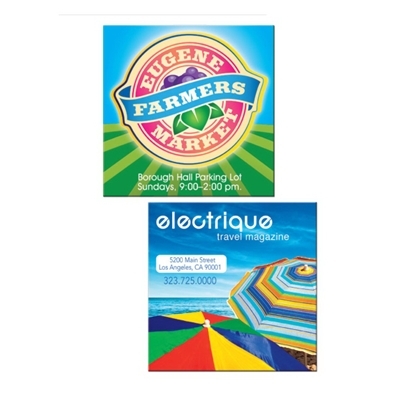 Made in the USA, our 4" x 4" square magnet displays a beautiful digital 4-color imprint of your logo. Hand it out and it'll hang on lots of refrigerators! Always in stock, the magnet measures 4" W x 4" H x 20 mil. Free setup and full bleeds are available. Ideal for special events, bars, restaurants, hotels, resorts and many more. 4" House Magnet. Tough and reliable 10mil paper face material with protective laminate seal. 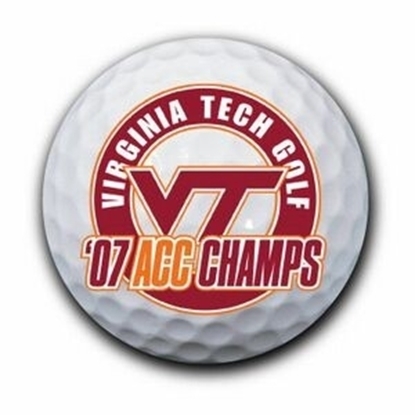 Solid 10mil magnet material. Brilliant full color imprint - standard. Magnets are non-branded. 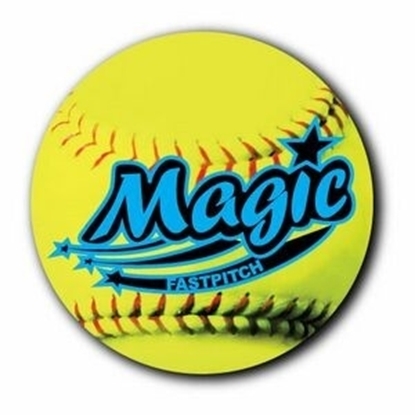 Run "circles" around your competition by choosing our 4" circle magnet! 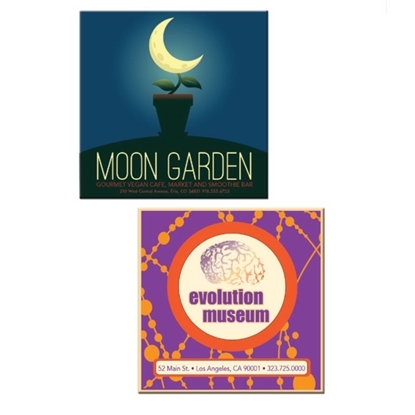 This USA-made magnet displays a beautiful 4-color imprint of your custom design that you can hang anywhere. 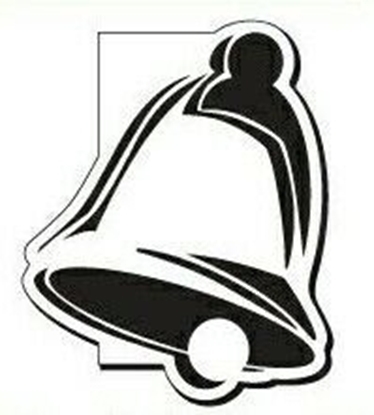 Always in stock, this product measures 4" diameter and 20 mil. Free setup and full bleeds are available. This item fits the needs of special events, bars, restaurants, hotels, resorts and many more. Hang it up and spread your message around town! Part business card, part magnet! 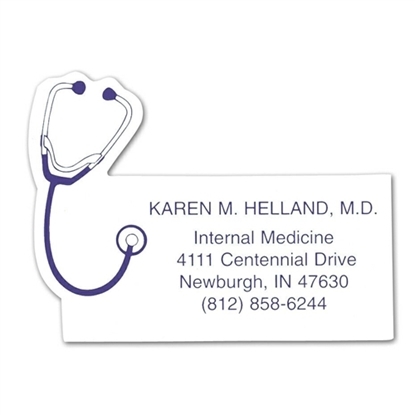 This magnetic accessory features a stethoscope design along the upper left corner; making it ideal for promoting medical offices and elder care providers. 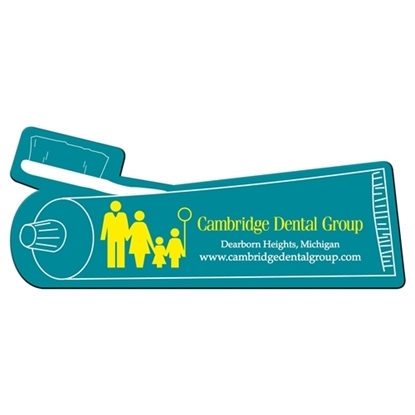 Always-in-stock and approximately 0.020 thick, this healthcare magnet can be customized with your company name, logo and specific message. 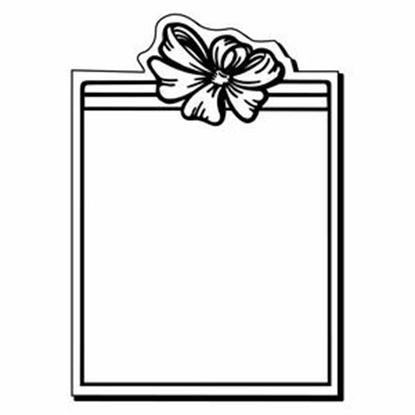 The finished products are great for sending as promotional mailers to patients, potential customers or employees. Popular clip magnets hold your important notes and pictures on to any metal surface. 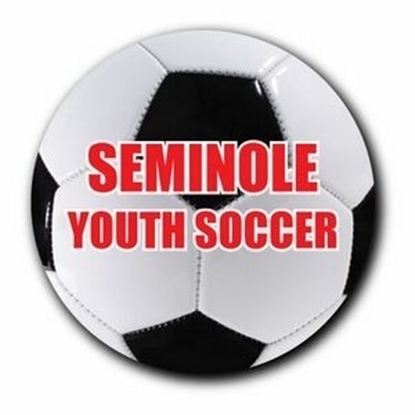 Large imprint area makes your logo pop. Durable spring loaded plastic magnetic clip. Features ribbed plastic "teeth" for a superior hold. Durable rubber grip. Extra strong magnet on back. Ideal for notes, documents or even to seal food bags. 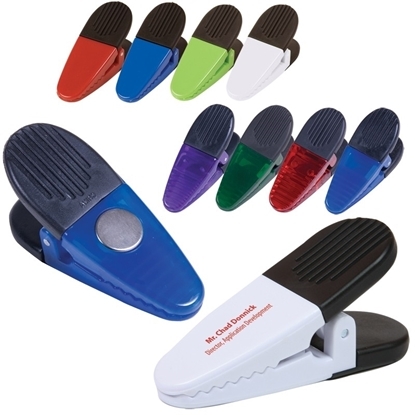 Get your promotional message in your customer's hands with this powerful magnetic clip! Use this colorful clasp to hold all of your important things. This clip is an ideal giveaway for conventions and trade shows. It's perfect for any home or office and great for use on chip bags. The clip also features magnetic backing. Your promotional message will "stick" with prospects while this Mega Klip does its job! Use this clip to hold all of your important things. Imprint the magnetic Mega Klip with your ad and they will be bulk packaged and ready for conventions, trade shows and more! Perfect for any home or office and great for use on chip bags. The Klip also features magnetic backing. Order yours today and package your brand for maximum recognition! Flexible 30 mil permanent toothpaste magnet to adhere to any steel surface. Unlimited Clip, Unlimited imprint options with britePix! Multiple templates available to jump-start ideas. Large ad area. Powerful magnetic clip. 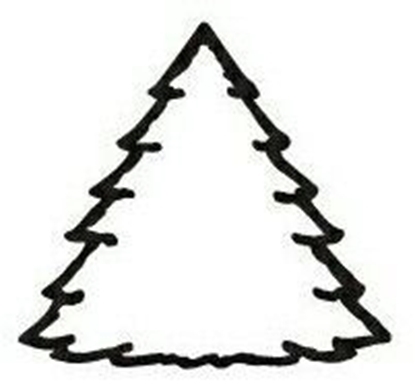 To add FREE stock graphic, please be sure to specify the graphic name on your order. 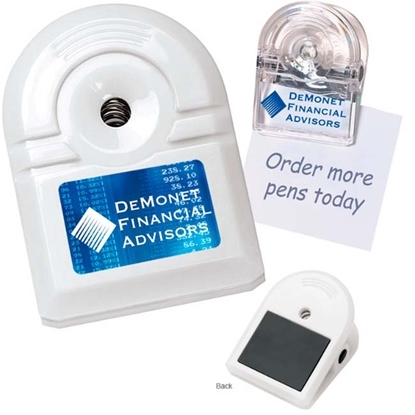 Your promotional message shows up brilliantly on this powerful magnetic clip! Use this colorful clasp to hold all of your important things. The ad clip is an ideal giveaway for conventions, trade shows and more! It's perfect for any home or office and great for use on chip bags. This clip offers a great size and imprint area. Affix your company name, logo or custom design on the ample surface and package your brand for maximum recognition! Show you care by giving this heart-shaped powerful magnetic clip at your next event! Use this clasp to hold all of your important things. It's an ideal giveaway for conventions, tradeshows and more! Great for the health care industry, affix your organization's name, logo or custom design on the bold translucent red surface and get your promotional message in your customer's hands. Order yours today and package your brand for success! 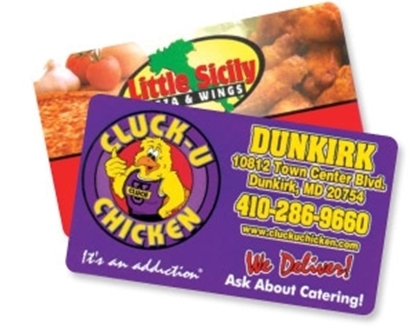 Get your promotional message in your customer's hands with this powerful magnetic clip. Available in a different translucent color options, this clip makes a great giveaway! Featuring a large imprint area, increase your brand awareness by having your business logo, name or custom design imprinted on the front. Ideal for schools, fundraisers, tradeshows and much more, hand out this billboard clip at your next promotional event! The house clip magnet is sure to be a big hit in the real estate and mortgage industry! This clip can hold paper while attaching itself to a magnetic surface. Use this clasp to hold all of your important things. It's also an ideal giveaway for conventions, trade shows and more! 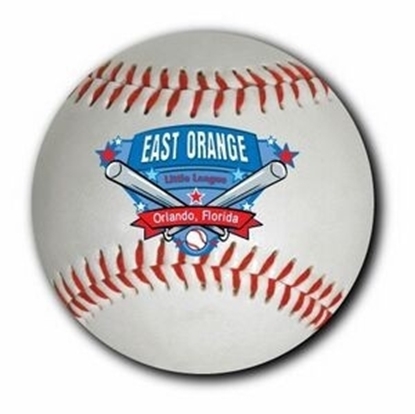 Affix your organization's name, logo or custom design on the bold translucent surface to complete the promo. Order yours now and package your brand for maximum recognition! Add promotional star power to your campaign by giving the star clip magnet! This item is sure to be a big hit in the financial and entertainment industries. The clip can hold paper while attaching itself to a magnetic surface. It has a black rubber grip at the top and comes in several brilliant translucent colors. 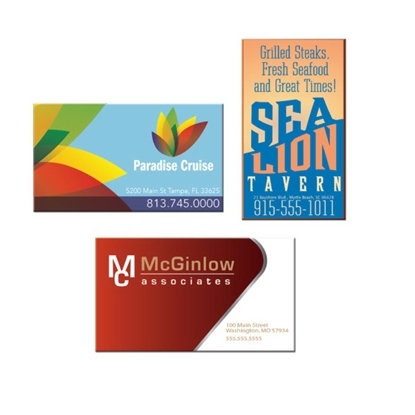 Imprint your company name or logo on the bold surface to complete the promo. Order now and package your brand for maximum recognition! 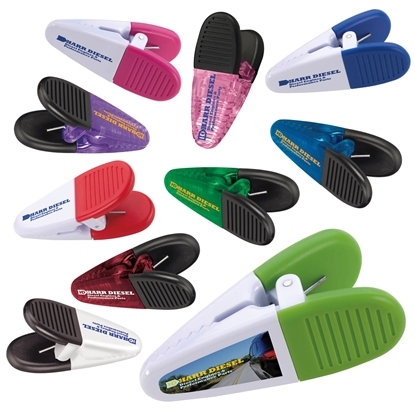 Mypromotionalpens.com offers the largest and best priced selection in Promotional Magnets. We will price compete and we won't be under sold. 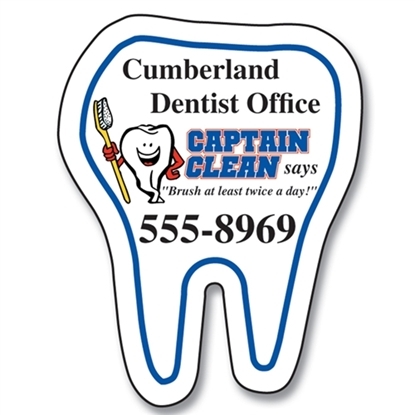 Let our graphic designers make your personalized Magnets standout above the crowd at no charge. We won't stop until you are completely satisfied with your custom Magnets art proof.Use category search filters on your left to help narrow your search to find exactly what you are looking for.